The National Cancer Institute estimates that more than 1 million new cases of skin cancer will be diagnosed in the US in 2007, resulting in more than 10,000 deaths — a disproportionately large number of which will be caused by melanoma. Invasive biopsies, in which skin lesions are removed and examined, are currently the primary means of diagnosing the cancers. However, biopsies can be painful and possibly traumatic for patients, and because the procedure is invasive, doctors cannot test every suspicious patch of skin. Interest in noninvasive optical imaging methods is therefore on the rise. Painless and repeatable, they allow investigation of tissue in its native state, without any tissue processing or staining. Techniques such as reflectance confocal microscopy and two-photon absorption imaging currently are being tested and, in some cases, are already in use in the clinic. Researchers recently reported that reflectance confocal microscopy might offer an alternative for diagnosis of actinic keratosis, one of the most common cutaneous malignancies. Currently, such diagnosis is based on clinical grounds, with accuracy of 80 to 94 percent. Shown here are two images of the atypia of the stratum granulosum, a layer of the epidermis. Achieving the sort of resolution seen in histology slides was one of the primary challenges of developing the technology for diagnosis of skin disease. In the May issue of the British Journal of Dermatology, a team with members at University Hospital of Berlin, at Hospital Ramon y Cajal in Madrid, Spain, and at Memorial Sloan-Kettering Cancer Center in New York reported that reflectance confocal microscopy might offer a viable alternative for diagnosis of actinic keratosis, one of the most common cutaneous malignancies, attributable to long-standing exposure to the sun, chronic immunosuppression and chronic cutaneous inflammation, among other risk factors. Astner and colleagues tested the efficacy of reflectance confocal microscopy for diagnosis of actinic keratosis. They used the VivaScope 1500, a commercially available instrument made by Lucid Inc. of Rochester, N.Y. Introduced in 2003 (The first generation of the device was introduced in 1997), the instrument offers in vivo subsurface imaging with cellular resolution — no small feat, said Jay Eastman, chairman and CEO of the company. The company also had to consider the ergonomics of imaging patients in the doctor’s office. “One of the key things is stabilizing the patient with respect to the microscope,” Eastman added, “so we have technology to do that as well.” In total, the company holds about 34 patents for the instrument. To test the instrument and assess the potential of the technique, Astner and colleagues looked at 44 patients, each with at least one actinic keratosis. They performed clinical evaluations and selected one skin lesion suspicious for early, low-grade actinic keratosis for further analysis with reflectance confocal microscopy and routine histology, with the latter validating the former. They found that reflectance confocal microscopy correctly identified 97.7 percent of the lesions as actinic keratosis, underscoring the method’s potential for diagnosing the disease noninvasively. Reflectance confocal microscopy offers near-cellular resolution (0.5 to 1 μm lateral, 3 to 5 μm vertical) and, in contrast with routine histology, allows investigation of horizontal tissue sections. Astner noted, however, that deeper layers are difficult to analyze because the optical penetration depth is limited to 230 μm. Similarly, the technique does not enable differentiation between actinic keratosis and invasive squamous cell carcinoma. The researchers plan to evaluate clinically unaffected skin sites with reflectance confocal microscopy to determine subclinical changes as well as the extent of precancerous alteration in sun-exposed skin sites. They also may explore the potential of automated image analysis to analyze the data quantitatively using morphometric measures. A handful of other dermatologists in the US are testing the efficacy of the VivaScope 1500. In Europe, a large study has been completed to determine the sensitivity and specificity for the diagnosis of melanomas, with positive results. The instrument already is in use in several melanoma clinics there. When detecting melanomas, clinicians look for changes in the distribution and biochemical composition of melanin, a natural pigment that protects the skin from ultraviolet radiation and is affected by the appearance and growth of melanomas. But melanin is weakly fluorescent and therefore inaccessible to many optical methods. Led by Warren S. Warren, researchers at Duke University in Durham, N.C., recently reported a two-color absorption imaging technique that sidesteps the usual need for endogenous fluorescence. 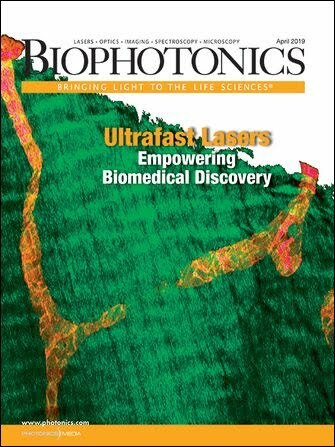 By exciting melanin and hemoglobin with highly controlled laser pulse trains, the technique allows them to measure their two-photon absorption with high sensitivity and to reconstruct cellular-scale images. Another group has described two-photon absorption imaging of melanin and hemoglobin, aiding in the diagnosis of melanoma — melanin is weakly fluorescent and therefore not accessible to many optical techniques. The instrumentation used to demonstrate the technique was similar to that of a conventional two-photon fluorescence microscope. As shown in the above schematic, a Ti:sapphire laser and an optical parametric oscillator (OPAL) provided the pulse trains, while a photodiode and an RF lock-in amplifier detected the absorption (AOM = acousto-optical modulator, RF = radio-frequency, DM = dichroic mirror, LPF = long-pass filter, SPF = short-pass filter, SHG = second-harmonic generation BBO crystal). Reprinted with permission of SPIE. Melanomas exhibit stronger absorption from melanin than from hemoglobin, Warren said. By using different colors, the investigators can discriminate between the signatures for the two, thus enabling diagnosis. They described the technique in the March issue of Proceedings of SPIE. The instrumentation used is similar to a conventional two-photon fluorescence microscope, with two exceptions: The pulse trains must be “shaped” so that the signatures can be extracted, and the pulses themselves (or backscattered light) are detected. In this study, an 80-MHz, 100-fs Ti:sapphire laser and an 80-MHz, 120-fs optical parametric oscillator, both from Spectra-Physics of Mountain View, Calif., provided very stable pulse trains for two-photon absorption — and because the pulses are only femtoseconds in length, they avoided overheating of the skin. The phase-sensitive detection consisted of a photodiode from Thorlabs Inc. of Newton, N.J., and a radio-frequency lock-in amplifier from Stanford Research Systems of Sunnyvale, Calif. The investigators demonstrated the technique by imaging mouse melanoma cells as well as melanoma lesions. Shown are slices of a 3-D image of a lesion, with a 10-μm Z-step. Reprinted with permission of SPIE. The researchers currently are collaborating with Dr. James M. Grichnik of Duke University Medical Center to develop the technology for the clinic. They envision an instrument in which the doctor can apply a fiber optic cable to a mole and characterize the distributions of melanin and hemoglobin, thus enabling noninvasive diagnosis of melanoma; the technique can reveal what is happening as much as a millimeter below the surface, which is sufficient for diagnosis. They are seeking funding to develop a compact laser system for this purpose and hope to have a working prototype of the device within three years. Before going to the clinic, though, they must validate the technique for in vivo use in mouse models. Researcher Ye noted that there also are concerns about tissue damage when using high-intensity ultrafast laser pulses. These must be addressed as well. Optical diagnosis of skin cancer generally faces hurdles to widespread implementation. Besides several practical issues — the costs related to acquiring new instruments and the lack of reimbursement by insurance providers — Astner noted the learning curve that accompanies the introduction of any new technology to the clinic. Systematic training of doctors and technicians in skin cancer centers should help with the integration of the techniques, she said.